NOTE: This content is old - Published: Wednesday, Jul 12th, 2017. There were celebrations at Wat’s Dyke CP School this morning for the grand opening of a brand new outdoor classroom. Children and staff gathered on the playing fields of the Garden Village primary school to mark the celebrations – which included a performance from the school choir and speeches from head teacher, Mrs Burke and representatives from the school’s Eco Committee. The new classroom, which had been an ambition of the schools for six years, was paid for by the Wat’s Dyke P.T.A. Situated on the school’s playing fields, the outdoor classroom was designed and built by the students and staff of the Carpentry and Joinery department of Coleg Cambria and the timber was supplied by Arnold Laver. The classroom was built to the school’s specifications and partially constructed in the Carpentry and Joinery department in Coleg Cambria, before being transported to the school for its final assembly. Coleg Cambria tutor Mike Ward explained that this project has been a first for Coleg Cambria working with a local school. Mr Ward and some of his team visited the school to tell the children about the project during an assembly and throughout the period of construction, with each class having the opportunity to visit the outdoor classroom to learn more about how it was being built. Those involved with the construction process, including Coleg Cambria students, took part in the official opening celebrations this morning – with Mr Ward having the honour of cutting the ribbon to the new classroom. 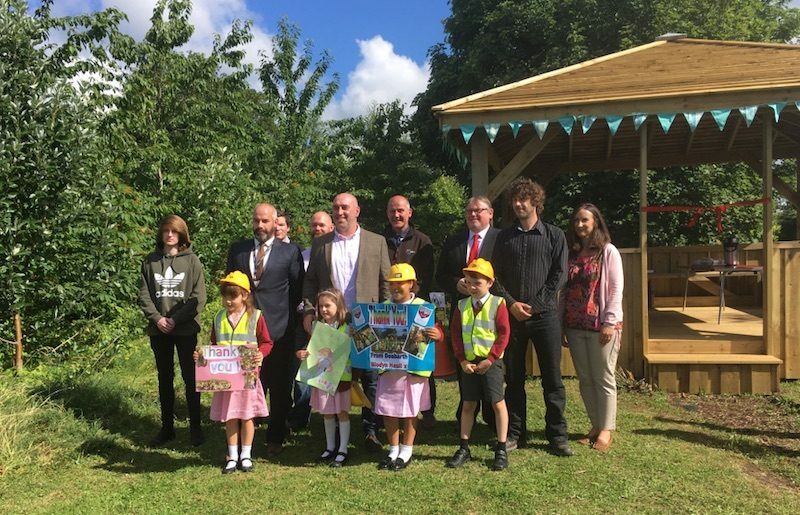 The new classroom, which replaces the school’s previous facility, will play an essential role in “enriching the children’s educational experiences” and allow access to the wildlife area all year round. Mrs Burke, head teacher of Wat’s Dyke School, said the project couldn’t have happened without the generosity of everyone involved. “Without the generosity of everyone involved in this project, our new outdoor classroom was something we could only ever have dreamt of in the distant future due to the cost implications,” said Mrs Burke. “Everybody involved has been extremely generous; the staff and students of Coleg Cambria have provided their time and labour in planning and constructing the outdoor classroom for us, the timber was supplied at cost by Arnold Laver which was a huge saving to us and equally fundamental in the whole venture have been the school’s P.T.A. and parents for their support with fundraising efforts, without which we could never have paid for such an extravagance. “This new outdoor classroom plays an essential role in enriching the children’s environmental educational experiences. The children will now be able to access the outdoors and our wildlife area in all weathers and gain a wealth of experiences regarding habitats and ecosystems within the school grounds. “Our previous outdoor classroom was no longer fit for purpose, whereas our new outdoor classroom can seat a whole class at a time and the children will have a secure sheltered base to work in.